CISA SuperReview was launched by Allen Keele in 2006. Since then, more than 8,200 CISA candidates have gone through the course. Allen is an industry expert and author of 6 books, including co-authoring the classic “CISA: Certified Information Systems Auditor Study Guide” with David Cannon. 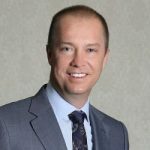 He is also a practicing info security professional, running various ERM and BCM projects for US government agencies and corporations such as Intel. Is CISA SuperReview good enough as a supplement or standalone product? Let’s take a look. As far as I know, CISA SuperReview is the only course that integrates video instruction, practice questions and simulation exams in one nice package. You don’t need to worry about matching the study units and missing part of the syllabus when using different study materials. This is the most efficient way to learn, as you can see from the many testimonial on their website. There are a good number of practice questions in each exam domain, with pre-assessment test at the beginning and post-assessment test at the end. Both sets of questions are the same but in different order. Each domain ends with a practice exams to make sure the concepts sink in. There are also 66 practice exams, each containing 100 randomly questions (picked from that 900+ test bank) and is designed to simulate the actual testing environment. The materials are updated twice yearly, meaning you will be getting one with the latest changes. 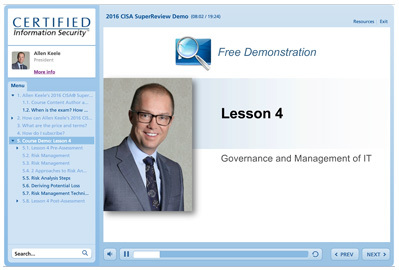 CISA SuperReview is the only course that gives you direct access to the instructor (Allen Keele). You can contact him by phone or email. 4. You Get CPE Credits! This is a really attractive bonus: once you complete the course and practice exams, you will be given 40 hours of CPE credit to your name. The certificate can be viewed, downloaded, and then printed from your online gradebook. Although there are no refunds or money-back guarantees, CISA SuperReview is willing to extend the access for 6 months should you fail to pass the exam. There is also a free online demo that you can watch before committing to this course. All in all I believe this is a great, worry-free product for CISA exam candidates. Once you get the package, simply follow the instruction, watch the videos, work on the practice questions and you are all set. Can we merely rely on CISA SuperReview without the books listed in https://ipasstheciaexam.com/cisa-books-study-guide/? Hi Allen. I just want to know that whether CISA online training course provided by Certified Information Security covers questions from CISA Review Questions, Answers & Explanations Database (ISACA CISA study material)? Allan….. Are the practice questions loaded onto a computer? Are the videos streamed from your site or on a CD or ? Do you provide a certificate so I can claim CPE?